PHOENIX (AP) Five home runs, 18 hits, 20 runs. The Arizona Diamondbacks have never had a better offensive night than they did Saturday against the San Diego Padres. David Peralta drove in three runs and matched his career best with five hits and the Diamondbacks set a single-game franchise scoring record with a 20-5 rout of the Padres. Goldschmidt, Ahmed and Avila also each had three RBIs. Ross (5-7) lasted just two innings, giving up eight runs and seven hits. Ross has allowed 15 runs in seven innings in his last two outings. Ray said it was ”very frustrating” to not get through the fifth inning despite such a big lead. Lovullo said he pulled Ray because of the high pitch count, even though it deprived the left-hander of a victory. 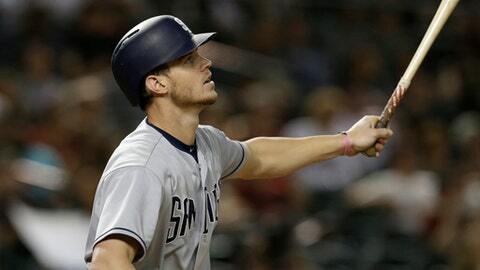 The Padres led 2-0 two batters into the game after Manuel Margot’s leadoff walk and Myers’ home run. But the Diamondbacks batted around to score five in their half of the first. Padres: LHP Jose Castillo was placed on the 10-day DL, retroactive to Friday, with a right hamstring strain. RHP Kazuhisa Makita was recalled from Triple-A El Paso. Diamondbacks: Avila (strained right hamstring) was activated from the 10-day DL and RHP Silvino Bracho was optioned to Triple-A Reno. Zack Greinke (9-5, 3.36 ERA), 4-0 with a 1.73 ERA in his last four starts, takes the mound for Arizona and LHP Clayton Richard (7-8, 4.46) goes for the Padres on Sunday in the finale of the Diamondbacks’ 10-game homestand.